When tragedy nearly destroys Brian’s family wine business, can this reluctant young heir forfeit his dreams and online love? 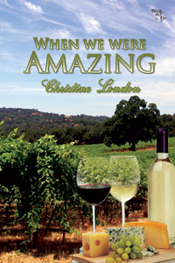 Mini-synopsis: Aussie wine heir Bryan Lassiter wanted nothing more than to be a self made man. When online love Carrie Sorrell flies half way round the globe to visit him, she’d no idea his magnetism would erase both their fourteen-year age difference and her common sense. As fate and a powerful family collide to tear them apart, will she have the strength to let him go or will it be the secret she’s so carefully protected that destroys?